Elegant, ergonomic design. Epic functionality. The amazing HR-310 and TSR-310 are Crestron handheld remotes reimagined. They combine all the best elements of our previous generation with even more advanced functionality and superb ergonomic design, incredible button feel, voice control, custom engravable buttons, profiles settings, and much more. 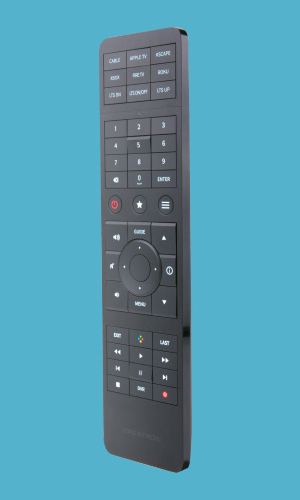 Crestron handheld remotes bring control to a luxurious new level. Ruggedized for durability and wrapped in a satiny smooth, easy-grip housing, they deliver exceptional comfort and ergonomics for hours of use. 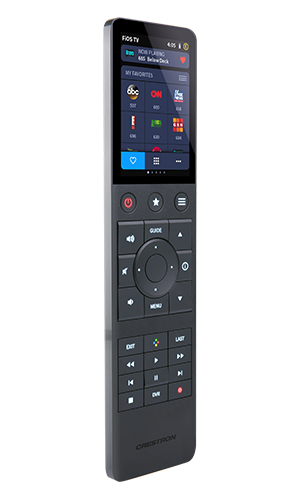 Designed exclusively for the TSR-310, the brand-new Crestron Performance UI delivers a user experience unlike anything seen before in a handheld remote. It transforms and elevates standard UI actions with smooth, stunning transitions, animations, and icons. Watch the how-to series of videos to see it in action. Scroll through some of the main UI pages to see what the Crestron Performance UI is all about. Custom engraved for your lifestyle. Make your remote as unique as you. Up to nine buttons can be custom engraved to display the functions you use most frequently. Update TSR-310 firmware to 1.003.0034 or later. Enter IP address of remote in web browser. The TSR-310 will restart in Performance UI mode. Pair with Pyng OS 2 system. Watch the how-to series of videos to see the new Performance UI in action.